The Trojan basketball squad is bunked at the historic Menger Hotel (everything in San Antonio's downtown is evidently "historic"), which is directly across the street from the historic Alamo, which is very cool for a guy like me who enjoys history. 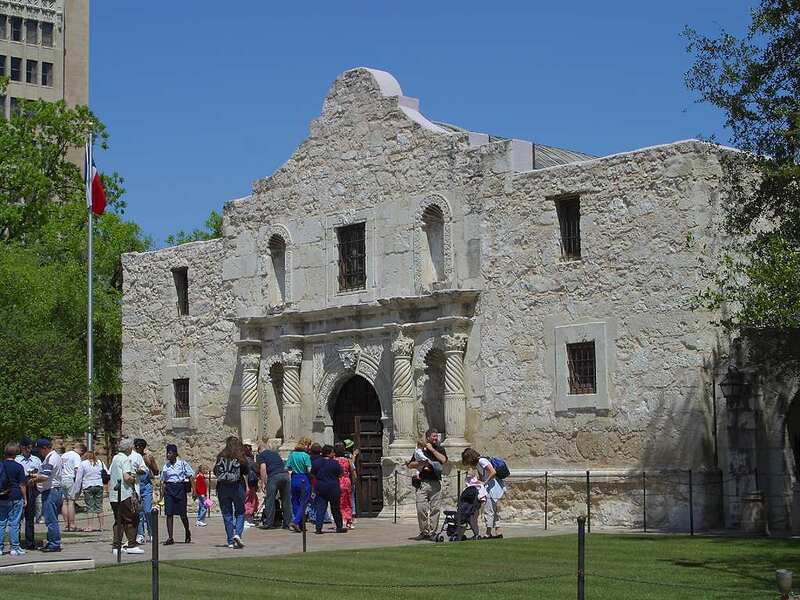 A reference as to where I'm blogging right this very moment: if I opened my room's window on the second floor and spit my gum as hard as I could, it'd hit the right side of the Alamo as pictured here: The reason why Troy basketball is here is to win an intercollegiate basketball contest against the RoadRunners of the University of Texas-San Antonio tonight. Troy has lost two in a row --to Alabama and Georgia State (both on the road)-- and sits at 1-2 early in the year. UTSA is 2-1, and neither school has a win over a D-1 program, so we don't really know what to expect from either side! Troy practiced on Sunday at the training facility used by the San Antonio Spurs, which was fairly incredible. We got a tour of the facility after practice, and senior guards Vernon Taylor and Regis Huddleston checked out Tim Duncan's locker (which was immaculate) and his shoes (which were not). 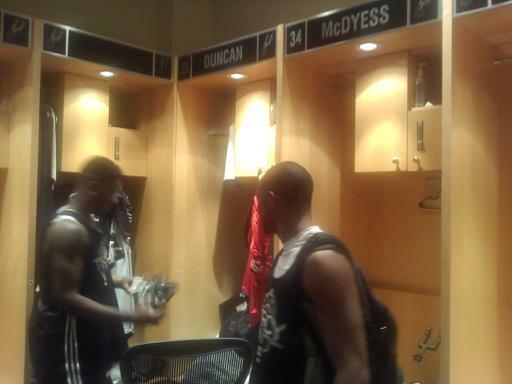 Regis is sitting at Antonio McDyess's locker and pointed out that Dice, like Regis, is a Mississippi guy; I asked if McDyess was from Meridian, as I remembered, but was quickly corrected: "He's from Quitman, man. Quitman.."
Media relations wizard Taylor Bryan makes his on-air debut for the 2010-2011 season on the radio coverage tonight. Tipoff is set for 7pm Central time, with our air time set for 6:30 on 94.7FM in Troy, 560AM in Dothan, and online at troytrojans.com. Then Troy prepares for a Friday game at Mississippi State! It's been a crazy schedule for me recently, but it's always great fun to follow the Trojans!